Shelley Engineering is excited to LAUNCH our new product the Mini Mezz, new to the UK. Challenging typical design ideas and methods, we believe in thinking differently. This creates beautifully designed products, which are simple to use and perfectly functional. Would you like to an ADDITIONAL *113 cubic feet of space saving storage? Perfectly designed for that smaller bedroom or studio flat. 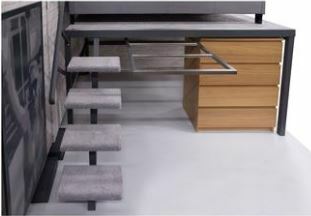 The Mini Mezz is not a bunk bed, but a modern, unique space enhancing product which gives another floor level to your bedroom or studio flat and provides all the storage needed for your clothes and accessories. Designed with you in mind for your smaller bedroom or studio flat the Mini Mezz is the ultimate bedroom space saving storage solution . Carpet (grey) fitted to stairs and cut for platform. Moving ? take it with you ! Dimensions : As seen on product pictures. Note : due to the rigidity of the construction and the manner of assembly, an additional 300 mm minimum is needed to slot the longest length together. If unsure, we are here to help, please contact the office on 020 8685 0302. Mini Mezz is designed and manufactured at Shelley Engineering allowing you to buy direct from the manufacturer saving your money and avoiding retail price enhancement. Forget the loft extension and buy a Mini Mezz now direct from Shelley Engineering : the designer and manufacturer. Please email stephenlaw@shelleyengineering.co.uk for special delivery requests.